Against the backdrop of the disastrous and crime-ridden tourist season in Abkhazia, Russia is building up its military power in this Georgian region. According to the information from our insiders, deployment of heavy armor across Psou frontier checkpoint (Abkhazian part of Russian state border with Georgia) has been continuing for more than a week. Those are mostly T-72B3 main battle tanks of the latest modification transported on platforms by tractor trailers. 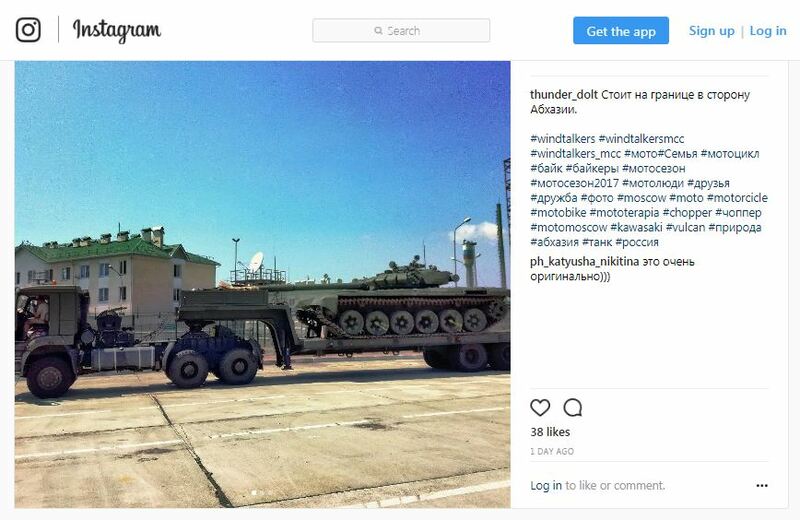 The volunteers of the International Community InformNapalm were able to find additional evidence of this, in particular, two different and unrelated Instagram posts containing photos of the tanks being deployed from Russia into the occupied Abkhazia that were published several days apart. 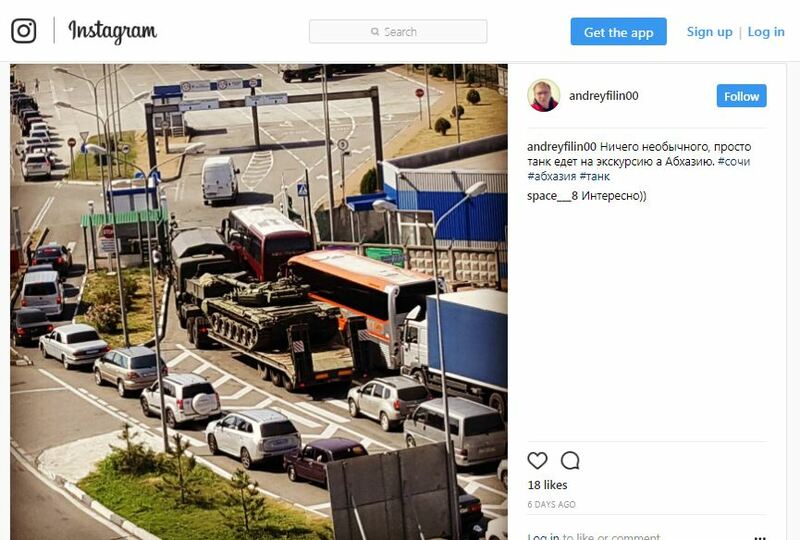 The first photo (Archive) was posted on July 18 and commented by the publisher with the hashtags “Nothing special, just a tank on a sightseeing trip to Abkhazia. #сочи#абхазия #танк” (#Sochi#Abkhazia#tank). The second photo (Archive) was posted on July 22 and was commented with the tags “Standing at the border in the direction of Abkhazia. #абхазия #танк #россия” (#Abkhazia#tank#Russia). Based on our analysis, those T-72B3s on the trailers are not the tanks of the 7th occupation Military Base (military unit 09332, Gudauta, Abkhazia, Georgia) that could be returning to the base after a military exercise, since such a procedure is usually well-organized and utilizes rail transport. Most likely, that equipment is being newly deployed from Russia to Abkhazia. There could be several reasons for this, in particular the build-up of Russia’s military presence against the backdrop of the disastrous and crime-ridden tourist season in the occupied Abkhazia and a mass exodus of Russians, as well as the escalation of situation ahead of the international military NATO-Georgia exercise Noble Partner 2017, which will take place between July 30th and August 12th. Note: according to InformNapalm, for more than a year the 7th Russian occupation Military Base in Abkhazia has been undergoing rearmament and troop replacements, mostly with contract soldiers. In particular, some of its BTR-80 APCs have been replaced with the latest BTR-82A APCs, and the underperforming T-90 tanks have been replaced with the improved and cheaper to operate T-72B3s. In addition, while evidence on the new equipment being transported into Abkhazia can often be found in public sources, there is hardly any information related to its removal. Thus, one can conclude that Russia is accumulating military equipment and weapons in addition to its occupation contingent in Abkhazia, to be available for immediate use at the designated hour. As it was mentioned in our recent article, Russia’s aggression against Ukraine is intertwined with the occupation of the part of Georgia’s territory used by the Russians as a military springboard. This relationship can be easily observed in the investigations carried out by the International Intelligence Community InformNapalm. The impact of the occupation of Georgian territory on the Russian aggression against Ukraine in the Donbas has been revealed by InformNapalm in more than 30 OSINT investigations. The publications cover the servicemen of the 7th Russian Military, who participated in the war in the Donbas on assignment to the armed gangs of Donetsk People’s Republic (DPR) and Luhansk People’s Republic (LPR). We should also note that the exclusive information of InformNapalm published in the article “Russia is building up its military presence in Georgia. New S-300 in occupied Abkhazia” in March 2017, served as the basis for strong political statements and international condemnation of Russia’s aggressive actions against Georgia.